A healing centre that just happens to be in the path of the Coastal GasLink Pipeline that will carry natural gas from northeastern B.C. to tanker ships waiting at the Port of Kitimat to sail to Asian markets. “We don’t want their money,” said Chief Na’Moks (John Ridsdale). 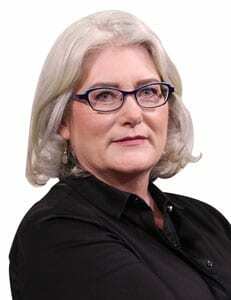 Ridsdale speaks for one of five clans that comprise the nation made up of 22,000 square kilometres of territory between Burns Lake and Kitimat. One of those men is on video posted to the group’s Facebook page turning back officials from TransCanada Corp.
It’s a peaceful rejection but the company will be back – TransCanada has to clear land for the pipeline it plans to begin constructing in the first quarter of 2019. And, sure enough, TransCanada filed an injunction Nov. 27 saying it would try to enter the camp again on Dec. 10. But the Wet’suwet’en believe fossil fuel will poison the land, kill the fish and sicken the wildlife. 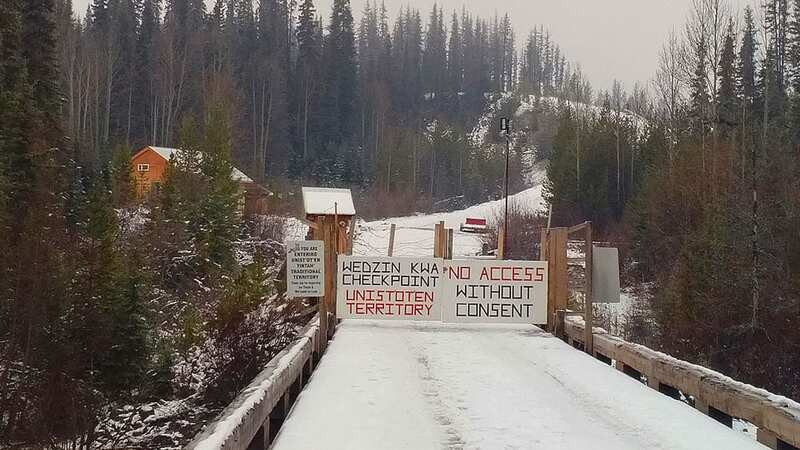 “The sound of stuff going through the pipe is going to disturb the moose and mountain goats,” said Ridsdale, who noted 23 per cent or about 190 kilometres of the pipeline would run through Wet’suwet’en territory. Ridsdale is proud of their opposition despite the rift it has caused within his community. TransCanada said 20 bands along the pipeline route have given their blessing after six years of meetings. 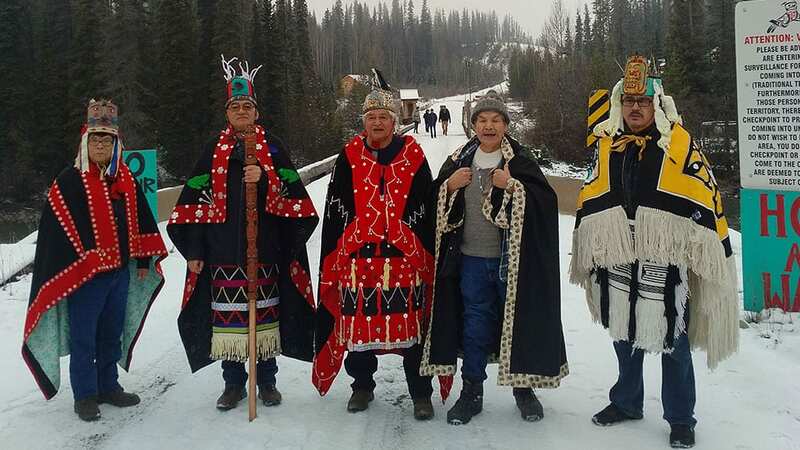 Only the hereditary Wet’suwet’en chiefs refused to participate, the company said. 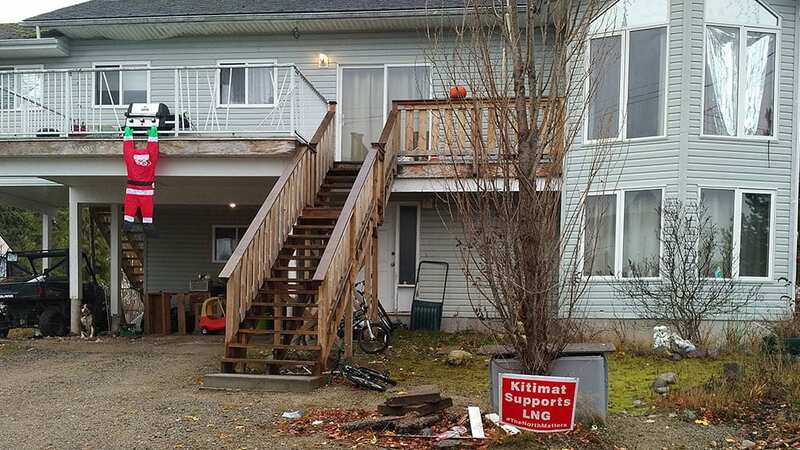 The neighbouring Haisla Nation also wants to help its hurting people. And use pipeline money to do it. Chief Councillor Crystal Smith said they will build a healing centre with LNG funds. “We want opportunity for our people,” she said standing on the shore of the Douglas Channel. 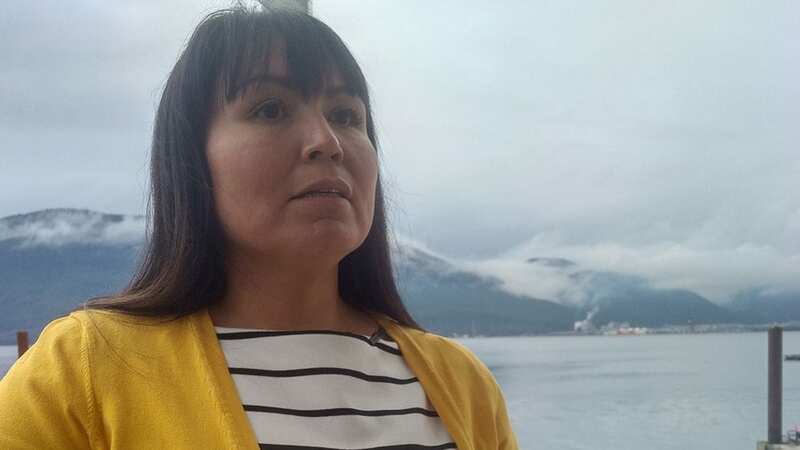 Haisla territory includes the coastal shoreline where TransCanada is dredging to deepen the port to accommodate big ships, which will carry the cargo after it has been liquefied at a new plant to be built here. LNG will set up shop next to Rio Tinto’s aluminum smelter at Kitimat. “That was an opportunity we weren’t a part of,” said Smith, tilting her head towards the smelter’s exhaust plume rising above the thick forest. Red-and-white lawn signs in support of LNG and its development in northern B.C. pepper Kitamaat Village, the band’s townsite. Along with jobs and funds, Smith said LNG has set a new standard for consultation. She said there were 86 meetings leading up to the project’s permit being awarded. Smith said other industries have come and gone – without remediating the pollution they left behind. She is confident that won’t happen this time. And, she said, hundreds of Haisla band members have left, too, in search of housing, employment and education elsewhere. Now Smith wants to give them something to come back for. Turning serious now, she reveals her common-law husband took his own life five years ago after struggling with mental illness. That has motivated her to put health and wellness at the top of her development list. “I want to change our quality of life,” she said gazing over the water. You can’t stand up if you’re oppressed”. Seems more like they’re worried about power and personal agendas than representing their people. If they don’t respect their own people’s right to speak – how can they expect others to respect what they say? It will carry Natural Gas just like any other Natural Gas pipeline going to your house!